As the world shrinks, we benefit by our willingness to gain an appreciation and respect for the diversity surrounding us. There is much to be gained by finding common ground with those whose cultures we have never experienced. I have so much to learn. 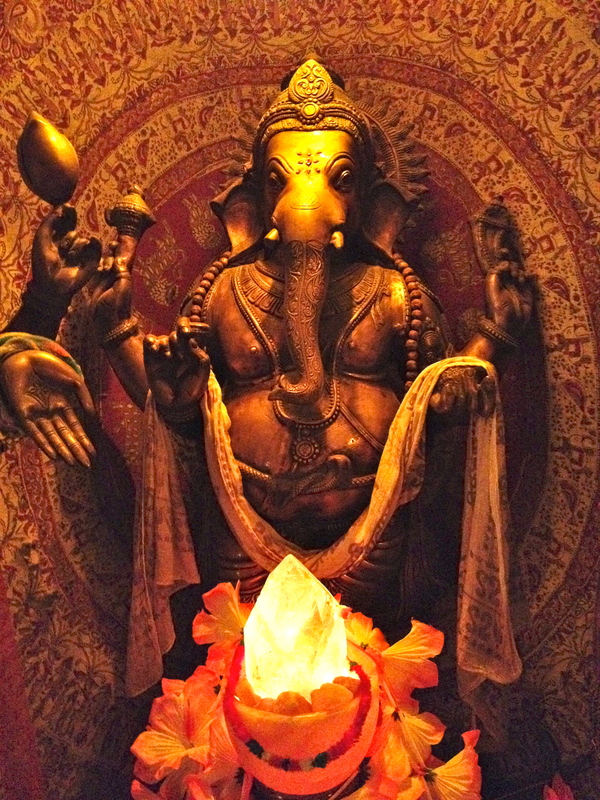 Buddhism and Hinduism are both ancient religions with their origins in India. the roots of Hinduism easily extend more than a thousand years before the birth of Christ. They are cultures both rich and full of meaning. To my Western understanding, there are similarities between the two religions that might reasonably be compared to the similarities between Jewish and Christian origins, beliefs and traditions. These symbols of their God, however foreign to us, should not deter us from understanding the universal truths which are part of these faiths. Many of the beliefs of Buddhist and Hindu teachers could come from the mouths of our own spiritual leaders, still others, are worthy of our respect. 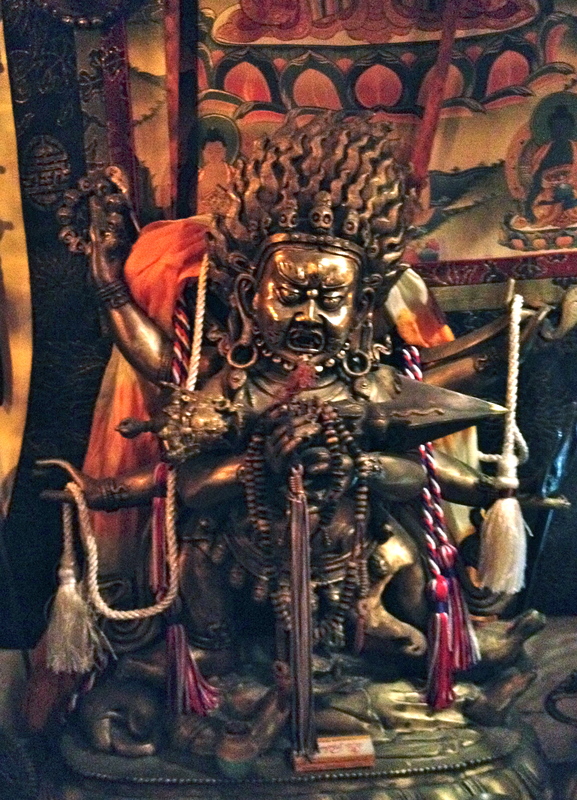 Vidyaraja was apparently a Hindu deity incorporated into Buddhism. He has many images representing such attributes as purification of the mind, wrath, protection of believers, eliminating evil. The opinions in our blog do not represent the opinions of our families, our employers or our friends. They do from time to time represent our attempts to understand the world around us. If we are in error in our understandings, we are happy for caring corrections. Eastern cultures are so rich with history, religious belief, the arts and education. 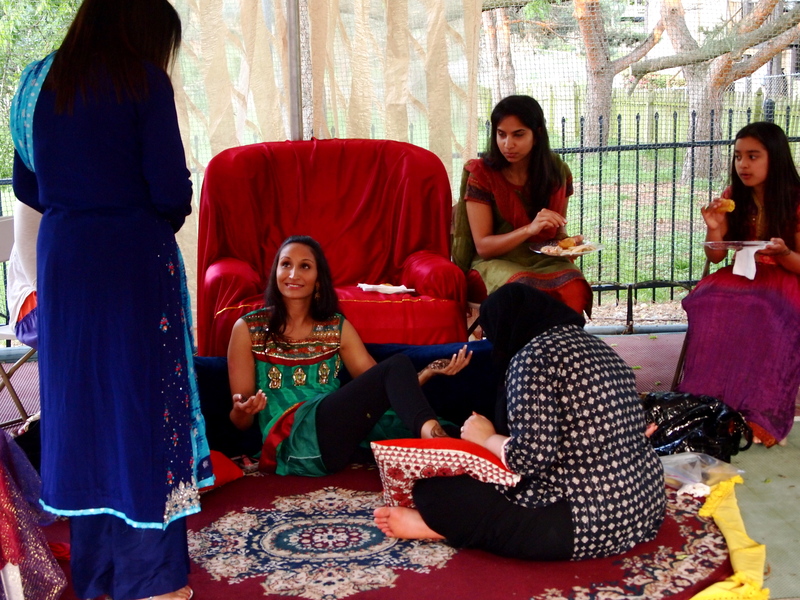 As a result of Meg’s posts on Natasha’s wedding ceremonies, we have a fair number of readers from India, the Philippines, Pakistan, Singapore, Bangladesh, Indonesia–the list goes on. We are grateful for your interest in our blog. From time to time we would like to share some of the wealth of art and wisdom that originates from cultures other than ours. A good friend, born Catholic, has spent a lifetime studying Eastern religions and acquiring art, primarily from India and Tibet. His collection, primarily of Buddhist sacred and less sacred, carvings, fabrics, and decorative objects, surround you throughout his home. Because he has attempted to capture the environment of a shrine, he uses dim lights and wraps his statues in beads, strings of light, fabric and other symbols of respect. I will include posts on our blog that include photographs of his collection. Buddhist (and Hindu) female deities are generally crowned, serene in demeanor and adorned with beads. Tibet’s fabrics are often ornate and generally rich with color and design. Tibet clothing can be quite lovely, with ceremonial clothing full of color, intricate design and elaborate headgear. In the West we are fortunate to see examples as banners, wall hangings and prayer flags. Even such examples give us a sense of the beauty of their design. While I love the beauty displayed from various works of art. I am grateful for corrections as I stumble with identifying various deities and ornamental items. Please feel free to correct me or to provide us with additional information. 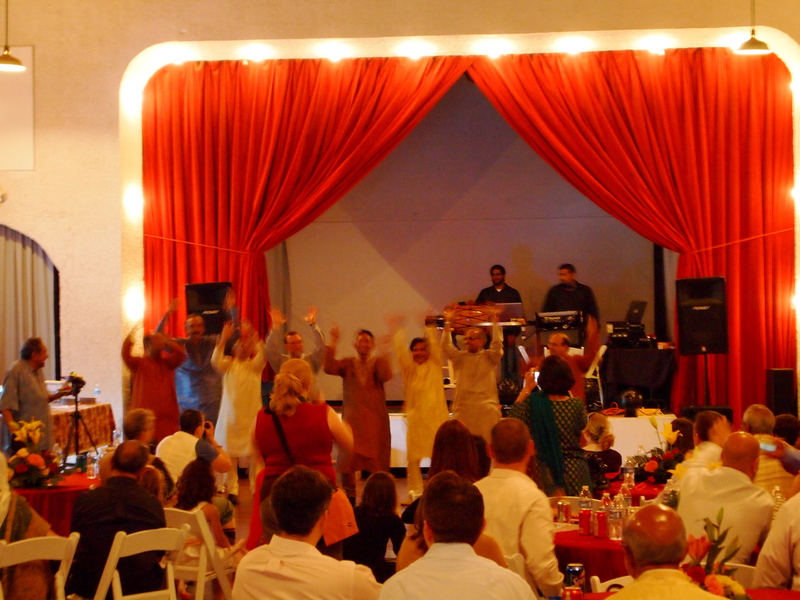 In Indian wedding tradition, a Sangeet is held one or two nights before the wedding ceremony. This is a ceremony of fun and laughter. For each of the ceremonial events, the bride wears a gown specifically created for her. The gown above is richly colored with intricate designs sewn into each panel of cloth. The Sangeet is also special because it is a time when the families and friends of the bride and groom show their talents through song and dance, and put on a good show for the couple. Traditionally, it is also an opportunity for the families of the bride and groom to become better acquainted. 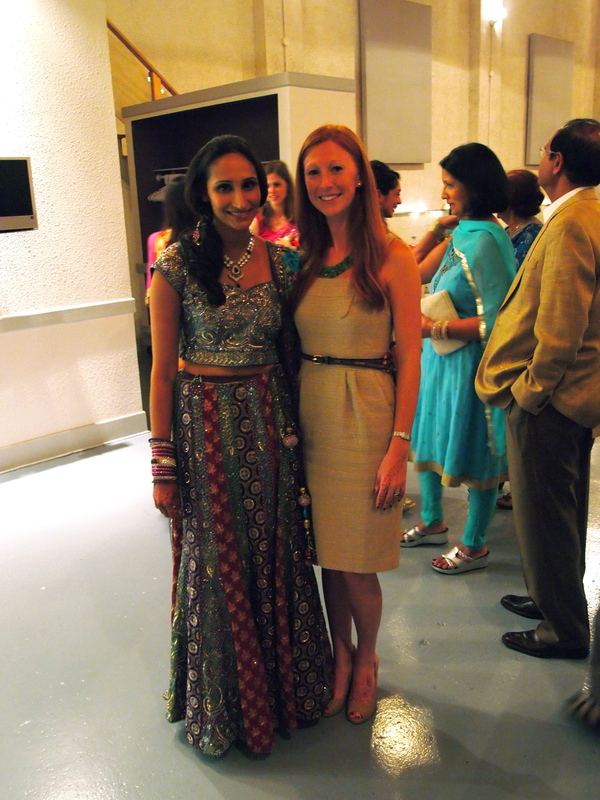 For Natasha and Noah’s Sangeet, the night of celebration was held at the Vox Theater on the Boulevard in Kansas City. 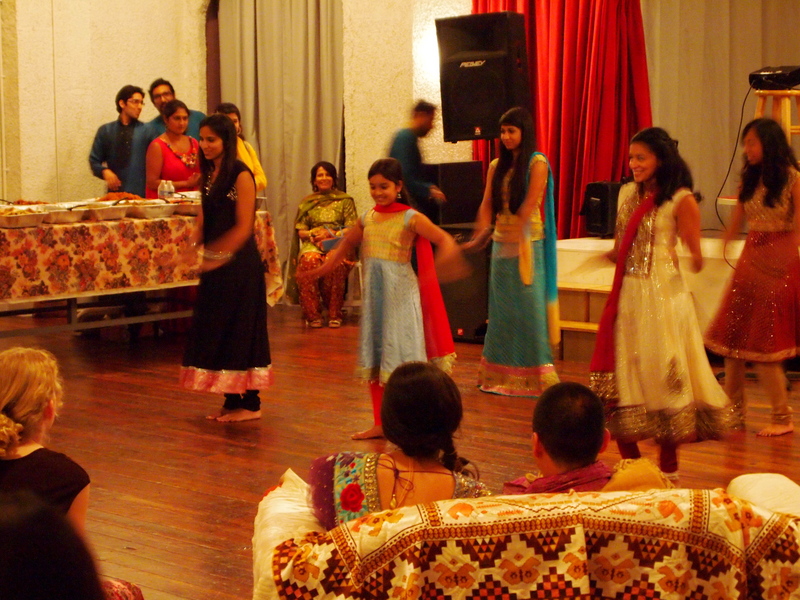 They had a large group of family and friends there to participate in the night. Their fathers put together a song and dance. Friends did a skit about how they met. 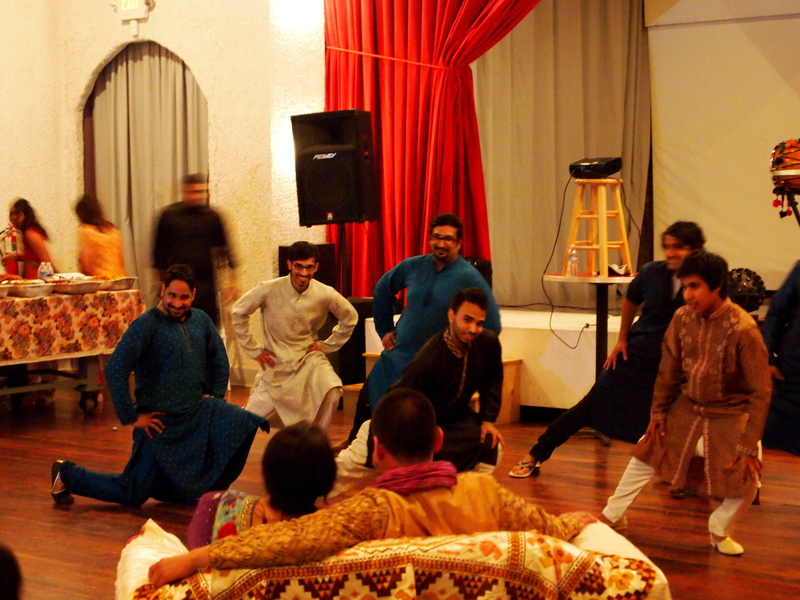 The cousins did an entire medley of traditional dances. During the whole show, Natasha and Noah sat on a special love seat arranged for them on the corner of the stage floor. The show was, naturally, for them. In addition to enjoying the elaborate songs and dances, we also ate foods that were absolutely delicious food. Natasha’s mom, Shaheen, made the most unbelievable samosas. And the rest of the catered cuisine was positively sublime. But as I mentioned above, the thing that caught my attention the most during the night was Natasha’s exquisite attire. 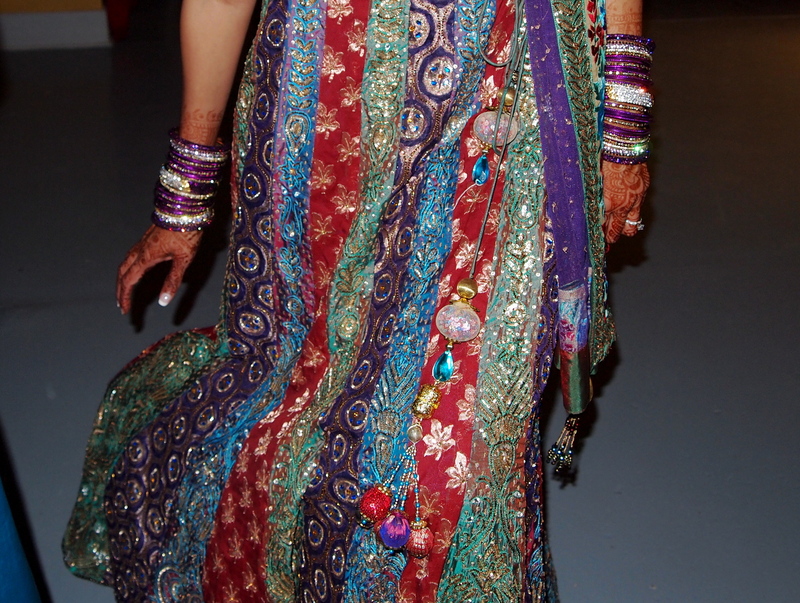 She wore a multi-colored saree, with blue, teal, purple and red, and of course, gold threading and lots of detail. Her hair was swept to the side and truly exuded the grace and elegance of an Indian princess. Every aspect of her attire reflected Indian art, beauty and culture. Sadly, the lighting in the venue was not ideal for taking great pictures, but you can still see how stunning she looked. The final day of celebration was the wedding ceremony and reception. It was a magnificent day with lots of happy surprises! One of my best friends from childhood got married this weekend. Natasha and Noah have been together for a long time, and they were finally able to become husband and wife on Saturday May 5th. As Natasha’s family is from India, we were all honored to be involved in a traditional Indian wedding. There were a few Jewish traditions included from Noah’s family as well, but we will wait to explore those until a later post on their wedding day. 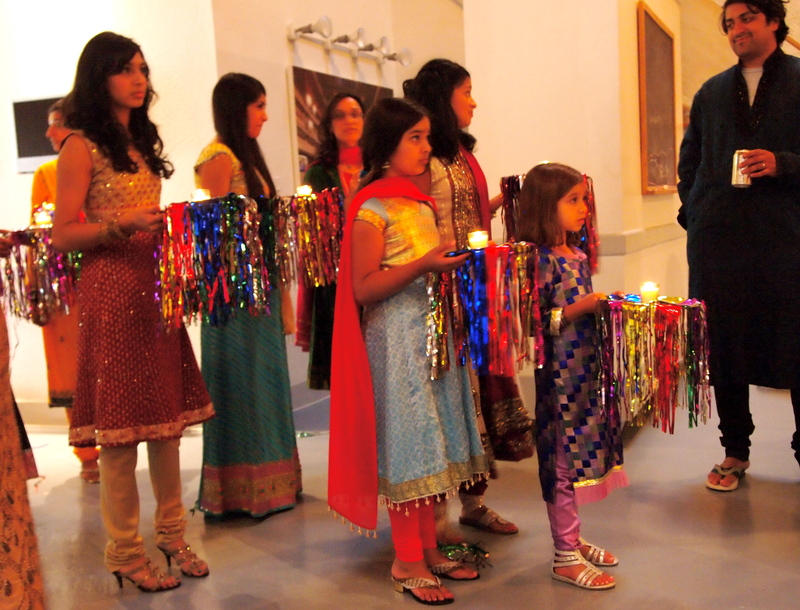 The first wedding event was the Mehndi ceremony. 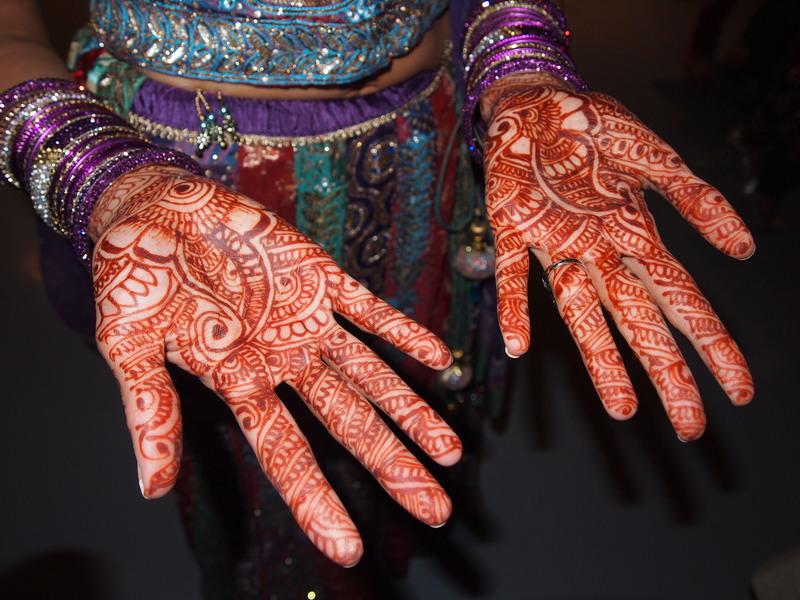 Mehndi is the application of henna as a temporary decoration of the skin. 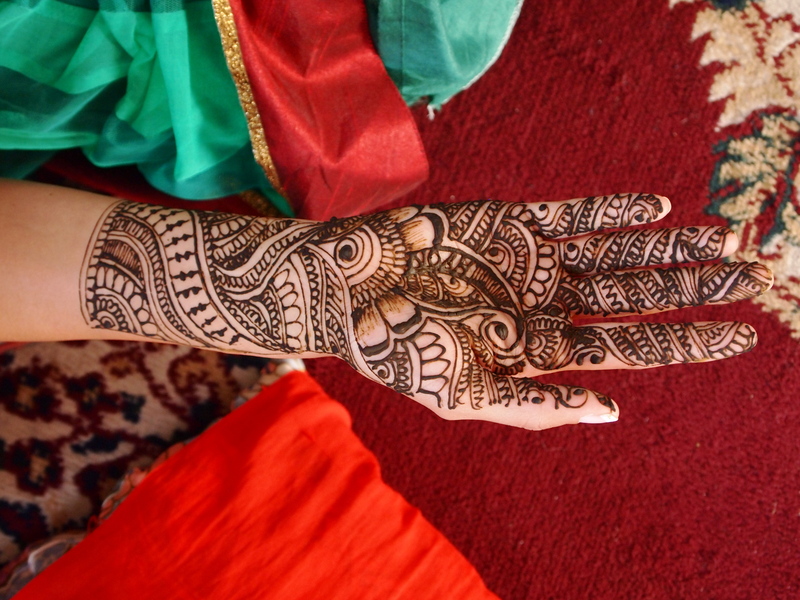 It is a ceremonial art form where intricate patterns are painted onto the bride’s hands and feet before the wedding ceremonies. Hidden in the patterns, the design includes the groom’s name. His challenge is to find his name. For Natasha’s Mehndi, Noah’s name was written in the palm of her hand (can be seen in the bottom picture of her right palm). 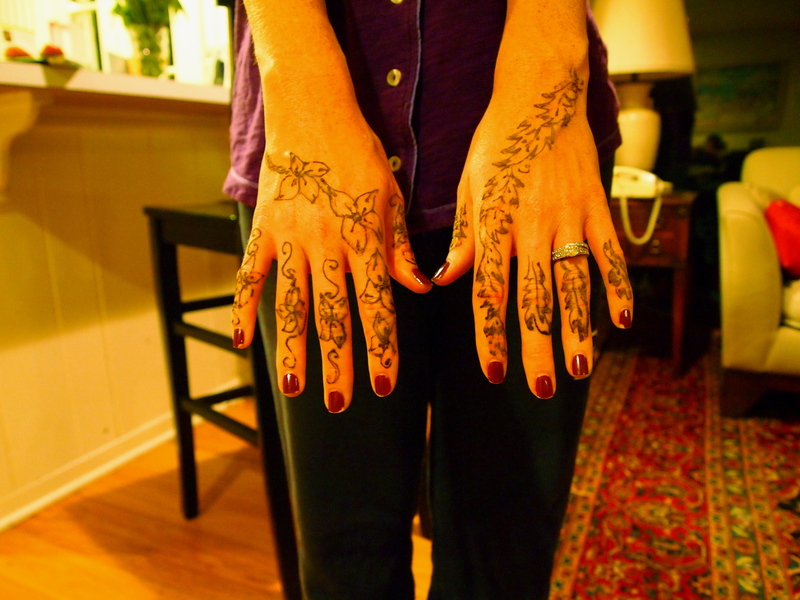 As I understand it, the old tradition was to apply henna to the bride only. 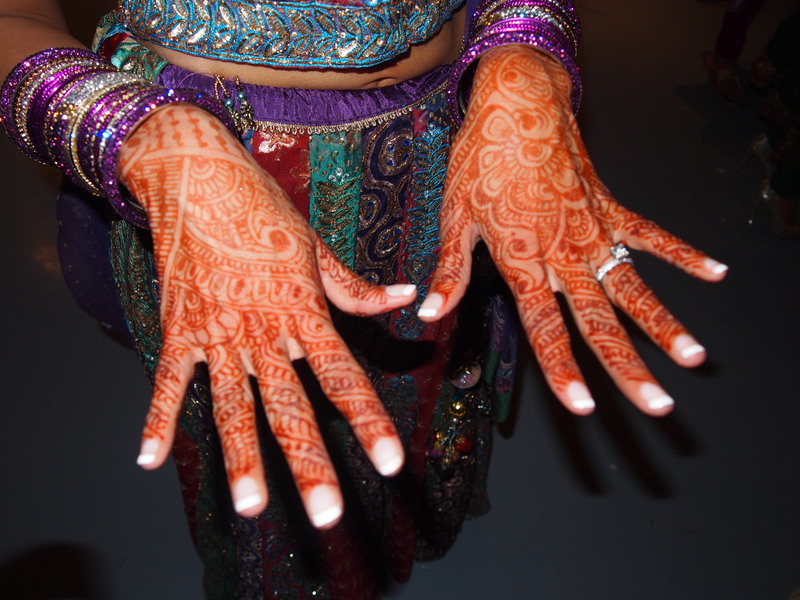 In modern times, many of the other women involved in the Mehndi get designs applied as well. As a bridesmaid, I jumped at the opportunity. Henna is applied to the skin from small cones filled with the paste. The paste then dries on the skin. As it dries, it stains the skin below. Soon the paste begins to crack and brush off, and then you are left with a beautiful reddish-brown stain on the skin. It is a beautiful ritual. Natasha looked positively stunning as she sat on her “throne” during her Mehndi. She was surrounded by her female friends and family members, and she definitely had the most beautiful designs. 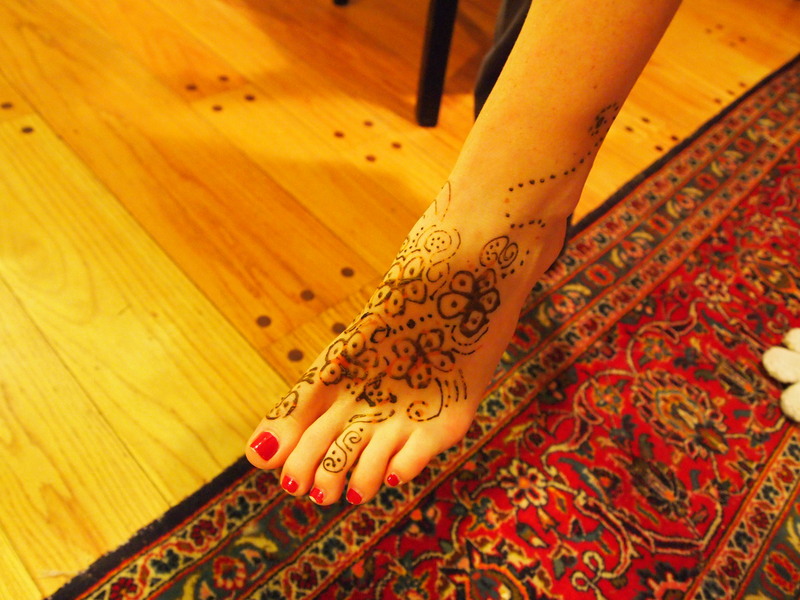 Both the backs and palms of her hands were completed covered, and her feet had beautiful designs as well. 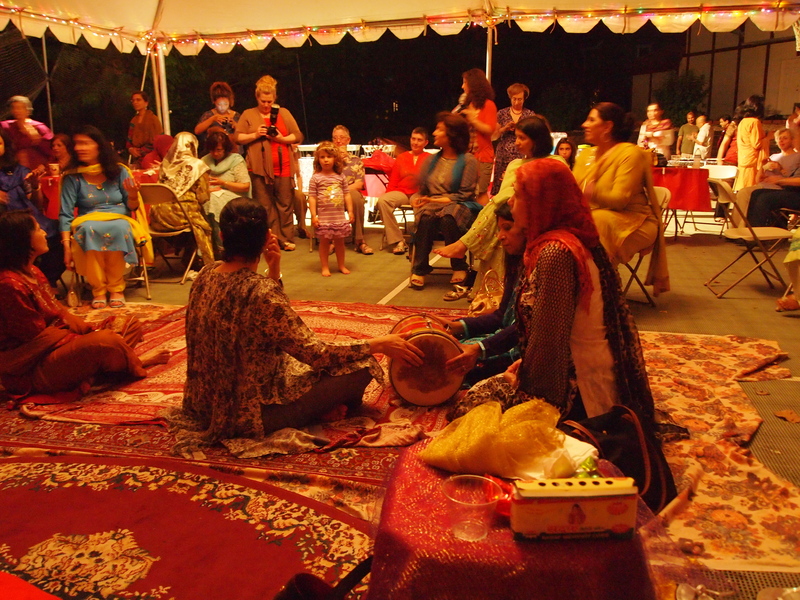 Following the Mehndi application, the women gathered together to sing, play the drums, and dance. 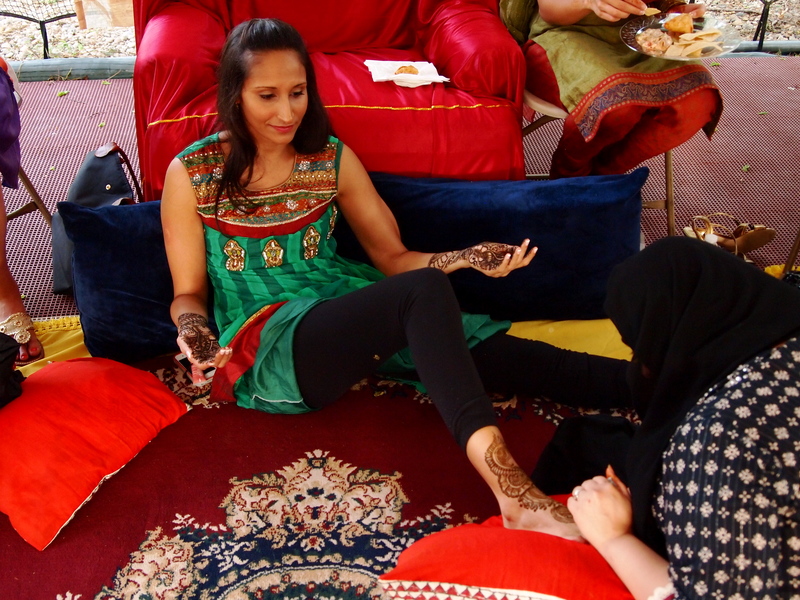 The Mehndi ceremony was a beautiful way to kick off the weekend of wedding festivities. Natasha looked beautiful, as always, and everyone had a wonderful time. The food was delicious, the music and dancing were joyful. It was a wonderful evening and a great way to start a beautiful weekend.